I think I found out! He/she looks to be a Jungle. Do u agree? Looks like a jungle to me and possibly Mack snow since at least in the picture it's black and white instead of black and yellow. More yellow coloring is probably in its future. Jungle is not a morph, just a, let's say, variety of one. Like Aliza said, he seems to be a mack snow. You have to wait though, he was obviously very badly kept and his colors are all messed up. That's interesting. How do you define "morph"? I don't consider jungle, reverse stripe, patternless, bold stripe etc. to be morphs. It's just a variation of one. Morphs are mack snow, albinos, blizzard, raptor, enigma, creamsickle, stealth etc.. If a mack snow is a jungle or bold stripe, it doesn't make it anything else, still it's a mack snow. Same with for example giant reverse stripe tremper albino het eclipse. What I would consider this leopard gecko to be is basically a tremper albino het eclipse (not so fancy, I know). 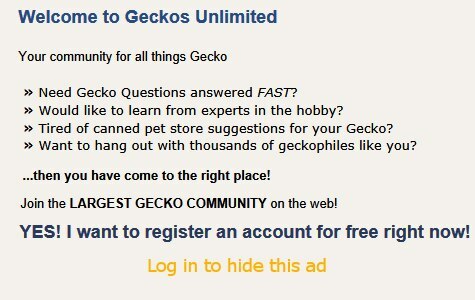 I see you telling people on this forum what morphs their geckos are. I appreciate you telling people that their gecko is for example high yellow carrot tail (and I'm sure they appreciate it as well). But that is not a morph. These geckos are usually a mix of albinos with something, nothing specific (and I know that you know that). I think that it would be better to tell them, because otherwise this mixing of albino traits won't stop and we will end up with a market full of worthless hybrids. Very interesting. I do think that the term "morph" has not been universally defined. It does seem as if you feel most comfortable defining morph in terms of traits that are clearly dominant, recessive or co-dominant and less comfortable labelling polygenetic traits as morphs (just my interpretation). I don't particularly agree, but I also don't care that much. I'm a little confused when you say that "These geckos [high yellow carrot tail] are usually a mix of albinos with something, nothing specific". Obviously, any gecko with unknown genetics can have hidden recessive genes such as albino that we know nothing about and I agree that it is not a good idea to breed them, but I see no reason why a high yellow carrot tail would necessarily have an albino gene. Did you mean, perhaps, that if I label someone's gecko they will assume that they can now breed it because they know what it is, and that increases the danger of mixing albino strains?